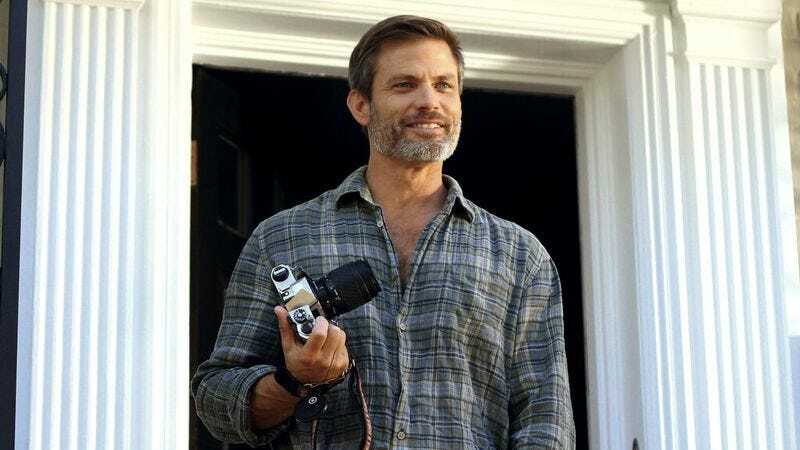 The actor: Casper Van Dien had already built up a sturdy resume as a television actor before getting his breakout role as Johnny Rico in Paul Verhoeven’s subversive sci-fi war movie Starship Troopers. Since then, he’s had a far-ranging and eclectic career, doing just about everything from enormous Hollywood projects like Sleepy Hollow to Syfy films like Fire Twister. He keeps incredibly busy—IMDB lists him as appearing in more than a dozen projects in 2015 alone—and shows no signs of slowing down. His latest role is in the indie horror film June, where he plays the adopted father of a girl who turns out to harbor a terrible secret. When The A.V. Club spoke to him, Van Dien was incredibly gracious, self-effacing, and more than happy to talk about everything from being in a wedding with Samuel L. Jackson to having a fairly notorious role on Beverly Hills, 90210. Casper Van Dien: June was a blast to film. It was in Louisiana, and I took it more or less because I’d just directed Victoria Pratt on a movie, and she told me that the actor they had in mind fell through and that she had talked to the director [L. Gustavo Cooper] about me, and so she’s like, “Hey, why don’t you approach him,” and she just handed me the phone. And the next thing I know, I’m talking to this guy and he’s telling me about this movie and I’m looking at her, she’s just shrugging her shoulders, and that’s how I got it—I got put on the spot. So I said, “Hey, great, send me the script.” He sent me the script, I liked it, and thought it’d be fun to go shoot. And I get down there—I had a blast. But the coolest thing about this whole movie was at the end of the film I looked around and I saw somebody had a “Death From Above” [From Starship Troopers.] tattoo on their arm. And I’m like, “What’s that?” He says, “Ah, you saw it—you saw one.” Everybody had done it. Everybody had done a “Death From Above” on their arm, from Starship Troopers, and our crew picture was everybody doing “Death From Above.” We had like 90-something people with a “Death From Above” tattoo on their arm. And those that didn’t have tattoos on their arms had it on their chest or something like that. It was really wild. It’s the first time that’s happened for me. But like, over 90 people with a “Death From Above” tattoo. So that was amazing. Absolutely amazing and wild. The A.V. Club: I assume this is still the role that people stop you for the most. AVC: That was a huge movie at the time. It must’ve been a little overwhelming for you and the other cast members when you came on the set for the first time. CVD: Yeah, it was something else. I was thrilled that Paul Verhoeven and Ed Neumeier—the director and writer-producer of it—and Alan Marshall all wanted me. I was super impressed that that was the case. And I get on the set, and Captain Deladier, who was the marine who was training all of us, we had done a boot camp and everything, the entire film all he would do is go, “Rico!” I don’t know if he knew who I really was, but he’d go, “Rico! Make sure the troops have all the water!” So I’d, as Johnny Rico, I’d have to go around to my two battalion commanders, and then I’d have to go down to each squad leader and then platoon leader and then each person and ask how they were doing on the water, so you know, sometimes we had 1,400 extras and I’d go and talk to every single one of them. So it was amazing. AVC: Was there anybody in particular that you bonded with while you were shooting? CVD: Michael Ironside was my mentor on that film. As my character mentor and also in real life, behind the scenes and on set. And I still hear his voice and everything, when I’m acting, to this day. The same goes with Clancy Brown. Both of them, they influenced me more than they know. AVC: You got to work with Michael Ironside again on that, right? CVD: I did. I actually recommended him for it. And he hasn’t spoken to me since. [Laughs.] No, I’m just kidding. He’s actually going to be working with my daughter soon on something, I don’t know if I’m allowed to reveal that, but my daughter, Grace, she’s going to be working with him, and she’s excited to see him… tomorrow, I think. But The Omega Code, I got to shoot in Israel, so I got to go to all the religious sites, and I got to walk up Masada with Catherine Oxenberg, Michael York, and Pat York. It was amazing to go up there and then go down to the Dead Sea and float in the water, so I think just being able to go and see that part of history—that part of the world that three of the major religions and so many branches of those religions all were birthed there, and were shaped and influenced there. And it’s just like the biggest spiritual place on this planet, so I think that was probably the thing that stood out for me the most. AVC: Your first onscreen credit seems to be in 1990 for a TV movie called Menu For Murder, and you were credited as a lifeguard. Does that sound right? CVD: Yes. Yes, I was. That was my first thing, and Larry Peerce, the director of that, he’s amazing. And the producers of that, I had them on my resume for the longest time because I was just so thrilled that they gave me my first job. And the director, Larry Peerce, afterward, he said something nice to me. He said, “Come here, young man.” And I said, “Yes, sir.” And he said, “I just wanted to tell you something. I’ve had the privilege of working with two men in this business—two of the most polite men that I’ve ever met or worked with in this business, and I wanted you to know that one of them is you, and the other one was a little-known actor at the time called Elvis Presley.” And I was like, “Thank you. Oh my goodness. That’s like the hugest compliment.” And he goes, “No, no. The reason I just complimented you is the fact that you’re this polite, and you’re an actor, and you’re this respectful. And I just want you to know that he was the only other one that I thought that of, and it’s been this long since I met another one.” I mean, he just said something like that to me and I was blown away. That was a huge compliment. So that movie, for me, even though I had two lines in it, it just impacted me. And the fact that he was such a generous man… I was grateful. I have a lot of gratitude for that film. CVD: [Laughs.] Yes, I did extra work on Saved By The Bell, and they gave me one line in one episode. It got me my AFTRA card at the time. My agents or manager at the time, they suggested I do that to get a credit so I could get in AFTRA, because if I had an AFTRA card then I could get more work as an actor in AFTRA shows, which was really sweet. And I did. I got on a show right after that. I got on Dangerous Women, I think. Actually, I don’t know if I got Dangerous Women first, or that. I don’t remember exactly how it went, but… No, I got Saved By The Bell first, then Dangerous Women. AVC: I assume Saved By The Bell must’ve been a fairly surreal set to be standing around on at that time. CVD: Well, what’s interesting is that I had been walking on the lot when I first came out here, and one day I walked on the Warner Brothers lot—this is before I got this, and I was just going on audition. And I was walking by and I went, holy expletive! There was this beautiful girl with two colored eyes, and I go, “You have the most amazing eyes!” And she goes, “Thank you so much!” And we talked for a little bit, and it was Elizabeth Berkley. And then I go and I get on as an extra on that show later—I’d never seen Saved By The Bell. So I still didn’t know who she was, and I get on, and she’s like, “Wait! You’re that guy!” And I go, “You’re in this?” And she’s like, “Yeah.” And I go, “I swear to God I’m not stalking you.” [Laughs.] So that was my Saved By The Bell one. “I swear to God I’m not stalking you. It’s just a coincidence. My managers—” She goes, “Yeah, yeah. Right.” And I’m like, “Oh my God…” But I was so impressed. She is beautiful and so sweet. What a sweet girl. CVD: Yeah. Brom Bones. Brom Van Brunt. What a thrill that was, to have worked on that set, and to have gotten to work with Johnny Depp and… The thing is that, at the time, I had quit smoking and I had quit drinking, and Johnny Depp was there, we were hanging around the set and he was rolling a cigarette and he was like, “Do you want one?” And I’m like, “Nah, man, I don’t smoke.” To this day I regret not taking the cigarette from Johnny Depp, because, man, I could’ve smoked a cigarette with Johnny Depp. One of the coolest guys I ever got to work with. He was always prepared, always on time, and just a joy to work with. Same with Tim Burton. One of the friendliest sets I’d ever been on. Everybody was just so thrilled to be there, but then you’re working with Tim Burton who is a top-notch director, and Johnny Depp, top-notch actor, and everybody is just bringing their A game. So it was a thrill. And they were all just so polite. AVC: Even just looking at the cast list for that, that’s quite a dream team to be on the set with all those great esteemed British actors. CVD: I was thinking I had to not joke around, because I was with the most serious and celebrated Shakespearean actors, and one day I was on set and it was my close-up. Tim Burton yelled “action,” and as they’re pulling back from me just to talk… I have my line, it’s a close-up on me, they’re pulling back and the camera’s going back, and just as I’m about to speak—there’s a headless body on the ground—and just as I’m about to open my mouth to speak, the body goes [Makes a fart sound. ]—makes this big fart noise. And I can look over in my peripheral vision, there’s Michael Gambon with a hand in his pocket, going, “Ha-ha-ha-ha-ha!” off-camera, because he had put a fart machine in the body and pressed the button just as I was about to speak. So I did my line… but they mess around like that. They have a good time. They’re a lot of fun. They’re very professional actors, but they also just—they know that we have to knock the piss out of each other sometimes. And it was a blast to work on that. AVC: I imagine there’s nothing quite like a fart sound to knock the piss out of anybody in the vicinity. CVD: I was a surfer. Long blonde hair. And I was not much of a surfer, but I was on that. Steve Tisch, the owner of the [New York] Giants, the producer of Forrest Gump, is just an amazing guy. He hired me for this, and Armand Mastroianni was the director, and it was just… It was a lot of fun to work on. A lot of cool people. AVC: That was your first series regular role, wasn’t it? CVD: No, Freshman Dorm would’ve been—no, I mean Dangerous Women would’ve been my first series regular. Yeah. That would’ve been my first. AVC: The difference being Freshman Dorm, that was more about young guys running around. Was there a lot of camaraderie on the set? CVD: We had a lot of fun on that, and they were good people. Matthew Fox was on that, Robyn Lively, Justin Lazard, Paige French, Kevin Mambo… but there were a lot of good people on that. AVC: Talk about having some big shoes to fill for a role. CVD: Yeah. I went back and hung out with his family a little bit in Fairmount, Indiana. I read seven books on him, I think, maybe more. I watched his 30 episodic TV spots that he did, and I listened to a little music that he listened to. I had a lot of fun doing that. That was a lot of fun to play James Dean. AVC: That was right in the post-Shannen Doherty era. Was the show running a little more smoothly behind the scenes at that point? CVD: It was really a great show. I walked on and Luke Perry and Jason Priestley both walked up to me at separate times and said, “Hey, welcome to the set, it’s really great to have you here.” They just really went out of their way to be really nice, so it was a great set, and they were awesome people. And Jason Priestley directed me in two of my episodes, and one of my episodes I actually used on my reel for the longest time, that he directed me in. So it was another actor directing an actor. I like that. AVC: You’ve sort of hit the trifecta of tornado movies. CVD: They were a lot of fun to work on, and none of them stood out more than the other ones. My friend asked me to do Fire Twister, and he’s just somebody that’s like, “Let’s mess around and see if we can have some fun with this.” And we did. And I ran around with his steady pod—it’s a steady pod stick, which you put a Canon 70D on—and I got some of my close-ups myself, so I was actually running and getting my own close-ups which was kind of unique—I’d never done that before. AVC: You got to work with Coolio and Udo Kier in the same movie, which not very many people can say. CVD: No, I don’t know anybody else, except for the other people in that. AVC: What was that one like? CVD: That one was directed by a guy who [was nominated for an] Academy Award for the very next film he did. [Laughs.] I’m calling him up like, “Dude, seriously?” But he said to me, “Come do this movie. It’s going to be a lot of fun. I always wanted to direct a vampire movie, and I want you do to it.” His name is Darrell Roodt, and he did Cry, The Beloved Country and Sarafina! and then I don’t know what the name of the movie was that he did that [was nominated] for Best Foreign Film, but it was the very next film he directed. [Yesterday—ed.] I’m like, “You couldn’t have put me in that one?” And he goes, “You couldn’t play a South African Zulu pregnant woman with AIDS.” I was like, “yeah… no.” So that was that. AVC: Do you remember anything in particular about shooting? CVD: I had so much fun with Tiny Lister. Actually Tiny Lister got married during that, and he invited me to the wedding and I was in there and Sam Jackson was his best man. And I was the other one. So that was pretty amazing. AVC: That sounds like a very memorable wedding reception. CVD: Yeah, it was. We were the two men in the wedding party, and if Sam Jackson couldn’t show up, I was going to fill in and be the best man. But Sam Jackson was there. And he always is! Sam Jackson’s everywhere! AVC: This seems like it was a Van Dien family project in some ways. How did that come about? CVD: It was my first film as a director, and it was a blast for me to play King David, Sleeping Beauty’s father, opposite my daughter. And it was David [Latt, the producer] who called me up and said, “Hey, I’ve got the perfect thing for you to direct. It’s Sleeping Beauty. Everyone else has turned it down. You can rewrite it but you’re not going to get credit for re-writing it.” [Laughs.] And I had a great cast. I had Finn Jones, Catherine Oxenberg [Van Dien’s wife], Olivia D’Abo, and then I had Maya Van Dien and Celeste Van Dien and Grace Van Dien. So I had a lot of good people, and I got Michael York to come in and do the voice-over for it… We got horses and we had lake monsters and we shot in this castle in Bulgaria… it was an absolute thrill for me. I had the best time. AVC: If you can shoot in a castle in Bulgaria, why not bring your whole family along? CVD: Yeah. They were a blast. And my daughter Gracie, who played Sleeping Beauty, is working all the time now, and I’m just thrilled for her.